NEW Purex Crystals ScentSplash is the next evolution of laundry in-wash fragrance boosters. It contains refreshing scent beads that release bursts of fragrance with irresistible freshness that lasts! This new Liquid Crystals formula is convenient and versatile enough to be used directly in the washer or in-wash tray, and is safe for all wash fabrics. Simply add a little or a lot. Purex Crystals ScentSplash is available in 3 Scents. My family LOVES Purex, we have been longtime fans of all their products. 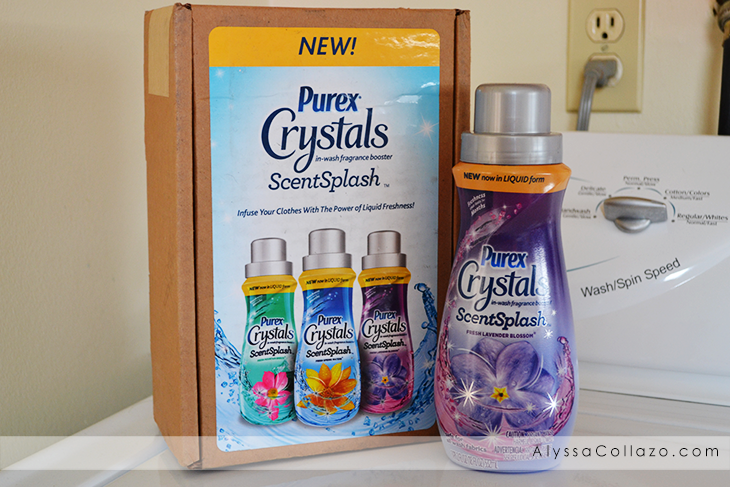 I have yet to try something from Purex that I didn't love and their new Purex Crystals ScentSplash is no exception. When they say it's Liquid Freshness they are NOT kidding! The Fresh Lavender Blossom scent is like a spring bouquet of wild flowers. I pair it with my favorite Purex Dirt Lift Action Detergent and it's truly a match made in heaven. I personally use Purex Crystals ScentSplash in my wash tray, I even dilute it with a little water (only because that's what my washer suggests). I can't begin to tell you how amazing my clothes smell and let's not talk about the softness. 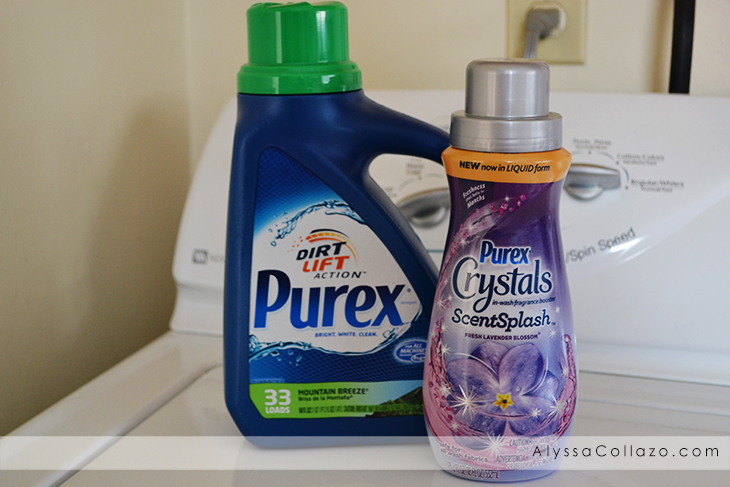 My first time using Purex Crystals ScentSplash I couldn't stop smelling my laundry! I would fold, smell, fold, smell.. You get the point. My fiance loved the scent it left on his work clothes. Purex Crystals ScentSplash works like a CHARM and is truly a long-lasting freshness! Want the chance to try this amazing in-wash Fragrance booster? Well, I have TWO (2) Purex Crystals ScentSplash full-value coupons! This giveaway is open to residents of the US only. Ends 4.23.15. DISCLAIMER: The Purex brand provided me with a sample of Purex Crystals ScentSplash in exchange for a product review. All opinions stated are my own and are not influenced by any affiliates. Purex is a great product. I use it all the time. I'm a big fan of the lavender scent! I'd love to try these and will make a note to pick some up. I bet that Fresh Lavender Blossom scent would be a favorite with me. I love Lavender scented products because the scent helps me destress and relax. We haven't tried this scent yet but love the other Purex products. Will definitely look out for this product in our store. I refuse to do laundry without purex crystals! I love them they make everything smell heavenly. I love the lavender. I've never used Purex crystals before but they look like a great product! Thanks for showing them to me! I can not wait to try the lavender blossom scent. I use Purex Laundry detergent. I love how fresh my clothes smell. I will have to try the crystals. Purex Crystals have to be one of the best inventions in the whole world. I love it every time I smell them. I have used Purex Crystals before and loved how they made my clothes smell! I need to grab them again. Love Purex Crystals! I use it in my wash and my clothes smell amazing. I wanna try Fresh Lavender. I've seen a lot of good reviews about the purex crystals, unfortunately, it is not available here in our neck of the woods. Must be smelling so good! I love laundry products like this which leave clothes smelling amazing. I am seeing so many great reviews on the Purex brand. I love Purex! Never knew about the crustals though! I'm going grocery shopping today so I may just pick some up to try! I have not tried Purex Crystals ScentSplash before but I definitely want to try it. I love our clothes smelling like flowers in the Spring, it's a very refreshing scent. I love Purex Crystals and can't wait to try them. Thanks for the giveaway. I am going to have to try these crystals. Perhaps they will cut down on the husband and kid stink lol. I do use Purex. It is one of few brands that doesn't cause my skin to break out. This sounds like a really nice way to add some pretty scents to my towels in the laundry. I would love to give these a try. Thanks for the info! I have never tried this brand before, but it sounds quite promising. Thanks for the giveaway! I'd like to try the mountain breeze scent. I think it would be least likely to bother the allergy sufferers in my home. I love it when the clothes smell good. We've never tried this brand though. But it does sound like a great product. Will take a look. I received the Fresh Spring Water to sample, and the scent is very long-lasting and noticeable. I would love to get my hands on the Lavender scent - that's one of my favorites. I am all about Purex products. They are affordable and smell great! Great giveaway! I love the Purex scent crystals! I put them in my home made detergent to give it a little kick! I just sent my sister to another site that was having a very similar giveaway. I'm gonna send her here too because she loves this stuff. My favorite are natural scents... I'd love to try the spring water fragrance. My husband buys these every now and then. Good stuff. Ohh a lavender scent - I bet this would be a super wonderful fragrance to it. I'm a lavender gal too. Love a nice calming scent with me all day.